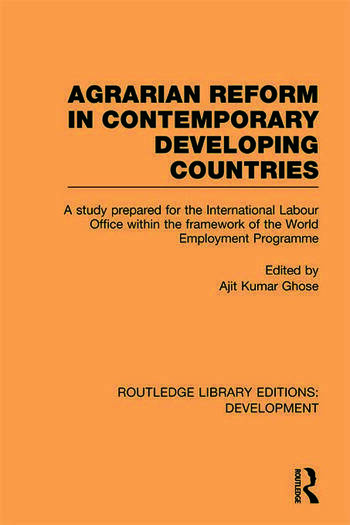 Initially published in 1983, in association with the International Labour Organisation (ILO), this book is about the meaning, relevance and process of agrarian reform in contemporary developing countries. It includes seven detailed case studies – one each on Ethiopia, Peru, Chile, Nicaragua, Iran, Kerala, (India) and West Bengal (India). In all the cases, serious contemporary efforts were made to implement agrarian reform programmes and the case studies focus upon selected aspects of this reform process – origins, basic characteristics, problems of implementation and immediate consequences. Each region differs considerably in terms of socio-economic and administrative conditions, but when the reform efforts are placed in their respective historical contexts, several common themes emerge which are dealt with in detail. In all cases, it is clear that agrarian reform is essentially a political process, requiring major social movements and that piecemeal reforms will not solve the grave problems of growth, distribution and poverty in the Third World.